The Geezers would like to big up The Eleanor Arms in Old Ford Road. The Eleanor is a CAMRA pub, and supports the Geezers WMBG? Campaign – hosting both the photo shoot and the launch of The Pun – The Geezers’ 2016 Bare-All calendar. 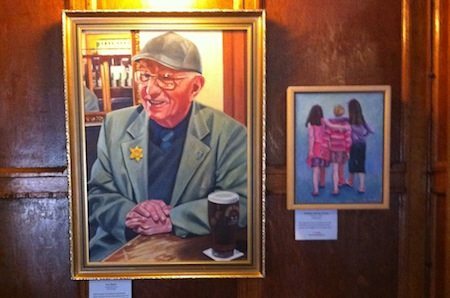 Currently the pub is exhibiting the paintings of Louise Gridley as part of the Down the Roman…Past and Present Exhibition, one of which is a portrait of Geezer Ray Gipson. If you like a traditional East End pub then The Eleanor is for you with its traditional pub games, real ale, music nights and good bar snacks. In 2014 they won The SPBW (Society for the Preservation of Beer From The Wood) Greater London Pub Of The Year Award. Great exhibition of Louise work as part of the ‘Down the Roman’ past & present Exhibition. Well worth a look in ‘Hairy Bikes’.